Punto Sur, I’m Back Again! Getting six people to agree on a restaurant for lunch is no easy feat, but since I’m not the type of person to back down from a good challenge… challenge accepted, buck passed — hey, asking colleagues for suggestions is perfectly acceptable — and goal accomplished! This afternoon’s pick… Argentinian at Punto Sur*. Though I had eaten there before, the food was decent, so I didn’t mind going back again. I remember the empanadas from last time being pretty tasty, so I ordered one as an appetizer. Again, the spicy beef. 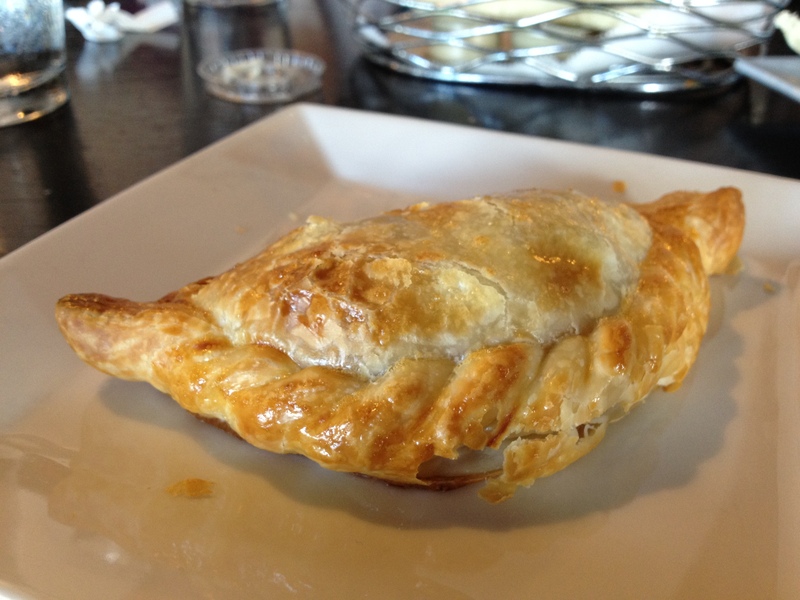 When I bit into it this time, I was reminded of a pastelito — one of my favorite pastries! 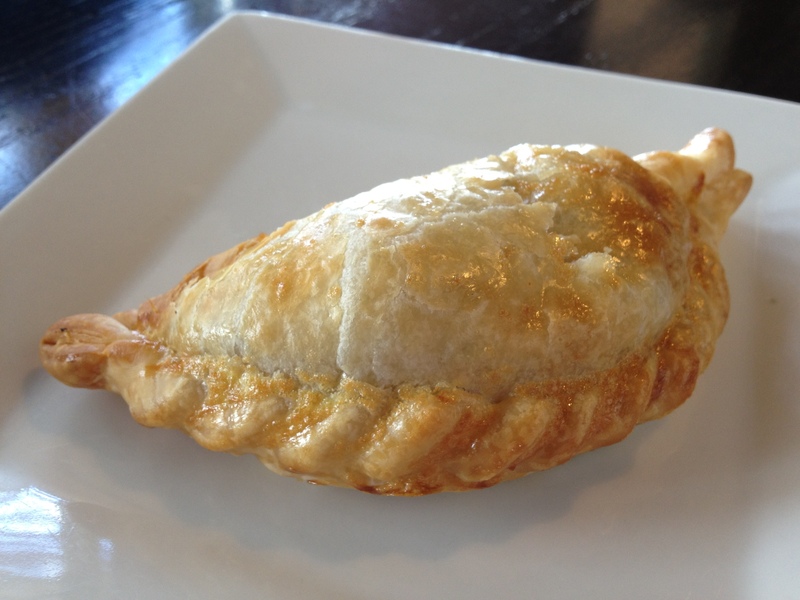 Not only was the flaky golden crust similar to that of a pastelito, but the meat inside was also flavored in a very similar manner. I like that this little guy was not too spicy, but just spicy enough. Woo. 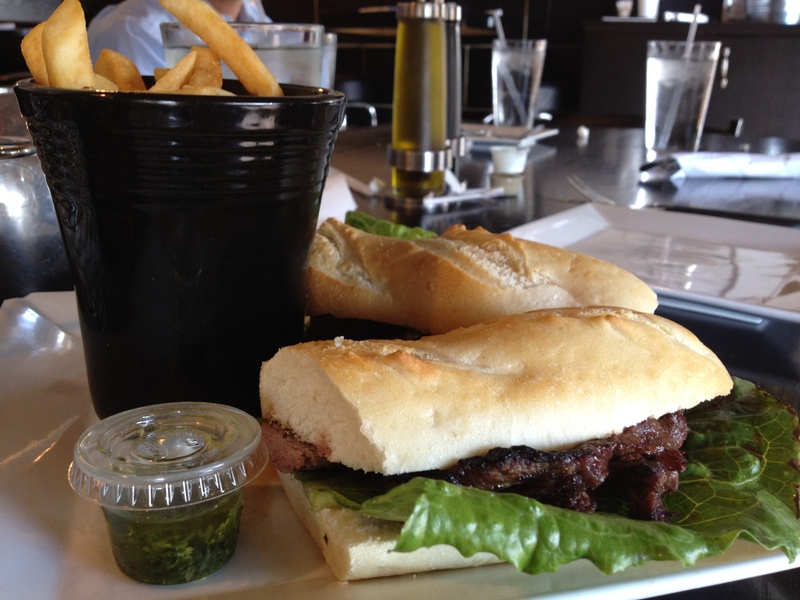 I also ordered the Flap Meat Sandwich (chimichurri on the side) with thick-cut fries. Taste-wise, there seemed to be little difference between this and the Skirt Steak sandwich I ordered last time, though I would say this flap (pun intended) of meat was a bit more tender/chewy and less tough. Overall, fine! To continue the meal, I sampled some empanadas, Latin American pastries filled with a variety of sweet and savory selections. I tried the carne picante (spicy beef) and capresse (mozzarella, tomato, and basil) options, which turned out to be somewhere between okay and fine, based on my previous experiences with empanadas. A little more filling inside would’ve been nice. 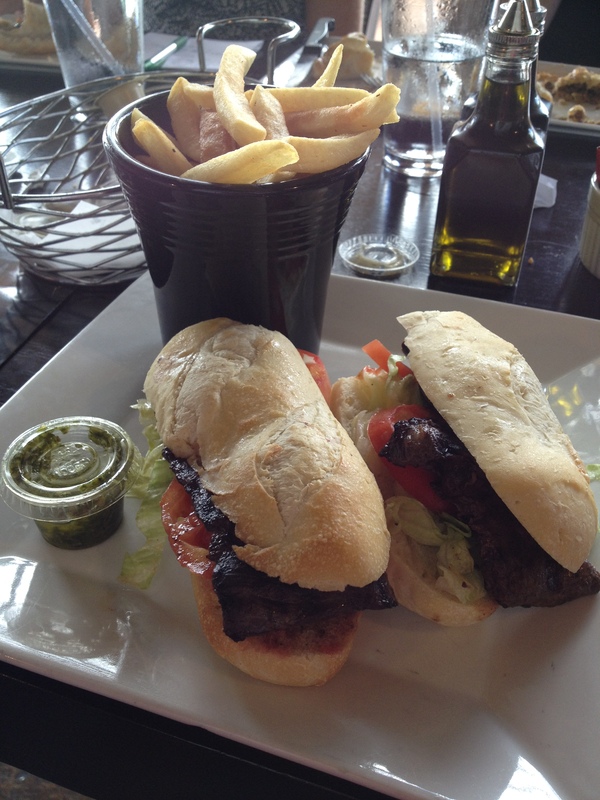 I ordered the skirt steak sandwich with fries for my main entree. 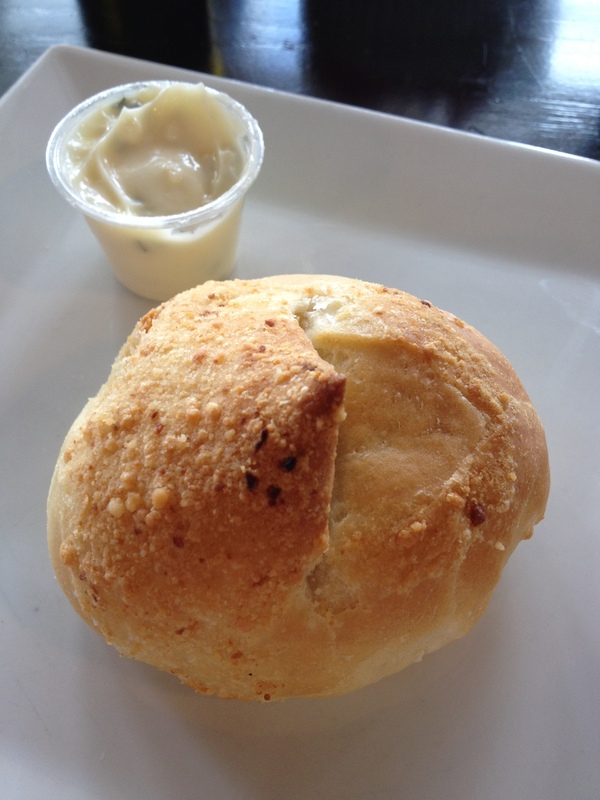 FYI, the sandwich is big enough to share, especially if you’ve had some empanadas or other appetizers already. 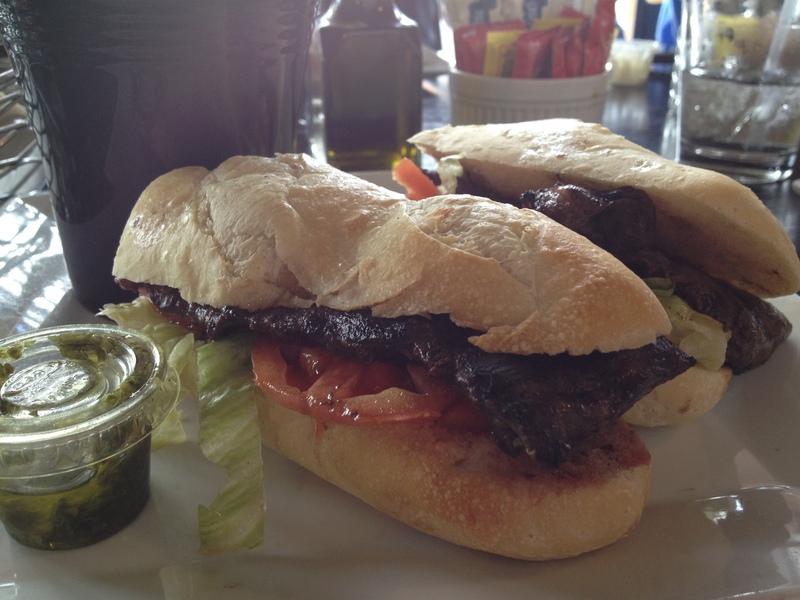 The sandwich came with green chimichurri sauce on the side to further flavor my skirt steak. Did you know that chimichurri sauce generally includes parsley, garlic, olive oil, oregano, and white (or red) wine vinegar? Or so Wikipedia says… but hey, that’s totally a legitimate source nowadays! The thick-cut fries were pretty standard fare, though I appreciated that they weren’t overcooked. I’d say the entree rated between okay and fine for me. It was generally what I expected it to be, so I’m not complainin’. Plus, I was with my Toastmasters crew, so it was all good. Good way to start the weekend.